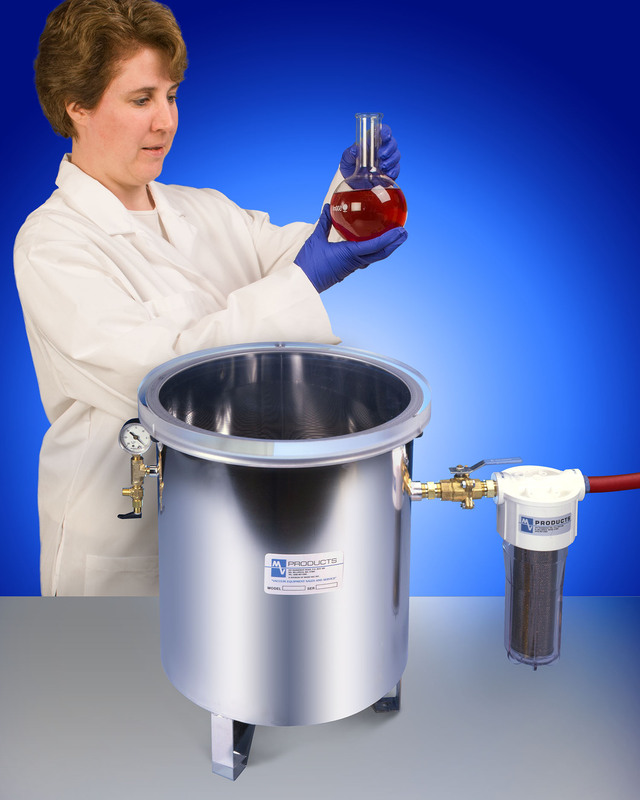 A robust benchtop vacuum degassing chamber for the elimination of entrapped air, gas, and water vapor from epoxies, resins, urethanes and other liquids is available from Mass-Vac, Inc. of North Billerica, Massachusetts. The MV Vacuum Degassing Chamber is constructed from 304 Stainless Steel with a pump out port, isolation valve, vent valve, Bourdon vacuum gauge, and a VisiTrap® inlet trap to prevent damage to the vacuum pump from vapors. Featuring a 1.5” thick clear Lucite® top for interior viewing, it rapidly removes entrapped air, gas, and water vapors from a variety of materials. Available in 15- and 4-gallon sizes, the MV Vacuum Degassing Chamber can be supplied with rotary motion feed-thrus, shelves, other accessories, and can be custom designed to user specifications. This versatile degas system is capable of operating at up to 29.9” Hg (0.5 Torr) and can be supplied with or without single- or multiple stage vacuum pumps from 5 to 20 CFM. The MV Vacuum Degassing Chamber is priced from $1,375.00 to $2,549.00. Literature and pricing are available upon request.